Can a tenant make repairs and deduct the cost from the rent? Residential. Under certain circumstances, a tenant may legally make repairs to the rental unit and then deduct the cost of those repairs from the next month's rent. The precise steps that a tenant must follow are found in A.R.S. Section 33-1363. In short, these are the steps: (1) the item to be repaired must constitute a noncompliance with A.R.S. 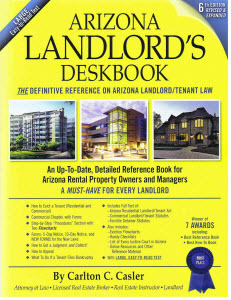 Section 33-1324 by the landlord, (2) the tenant must then provide the landlord with a written notice that specifies the need repairs, gives the landlord the statutory time to make repairs, and must also notify the landlord of the tenant's intent to effect such repairs if the landlord fails to make the repairs, (3) the repairs must be done by a licensed contractor, the tenant must pay the contractor for the cost of repairs and the contractor must provide the landlord with a lien release for the repairs performed, and (4) the amount of the deduction may not exceed the greater of $300 or one-half month’s rent (Example 1: if rent is $500, the maximum amount of repairs is $300; Example 2: if rent is $1,000, the maximum amount of repairs is $500). Commercial. The commercial landlord/tenant statutes do not give a commercial tenant a "self-help" remedy. Moreover, almost all commercial leases prohibit a commercial tenant from deducting any amounts for any purpose from the rent.